The sensational UK R&B singer - Hayley Cassidy is about to tear up the stage at her own headlined show this April. It's been a long time coming since we were bound to see Cassidy take to the stage to perform her songs, and she's going all out! 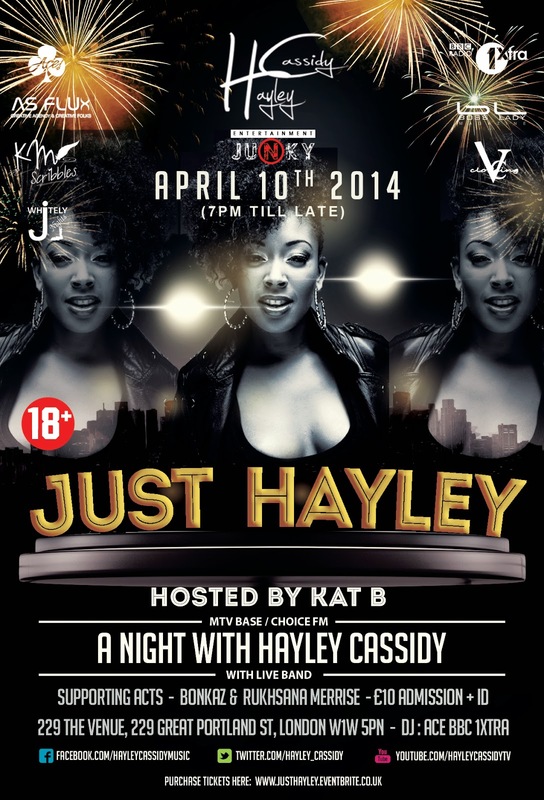 Hosted by MTV Base/Choice FM's Kat B, Entertainment Junky and Team Cassidy presents: ‘A Night With Hayley Cassidy #JustHayley’ a night that we'll see Hayley perform with her very own live band, and performing her favourite songs from her album ‘Stripped’, she'll also perform unreleased material for us to enjoy. The night will see support from acts including rapper - Bonkaz, and singer - Rukhsana - who will both be providing real authentic UK music. Tickets are £10 and can be purchased from http://www.justhayley.eventbrite.co.uk or http://www.229thevenue.com/portfolio/hayley-cassidy/ - there will also be goodie bags, free giveaways and many more surprises on the night. This is an 18+ event, so ID will be required! Come down and support homegrown British talent! "A night with Hayley Cassidy is only the beginning..."